A peristaltic concrete pump uses a squeezing motion on a rubber hose to move concrete. 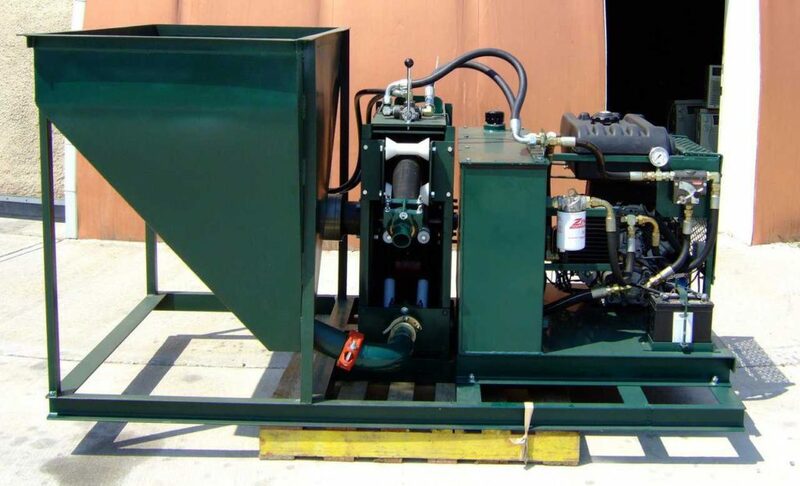 Better known as a Squeeze Pump, these machines are simpler to operate and to maintain than the common piston pump. The peristaltic concrete pump is also more forgiving and less dangerous than other concrete pumps. The Cart-Away Skweez Pump is the perfect pumping companion for the mid-sized mixers in the Cart-Away product line. We chose peristaltic pumping technology because it can be stopped and started between concrete mixing batches. Piston driven concrete pumps work at much higher pressures and do not perform well on small batch applications where stopping between batches is necessary. A peristaltic concrete pump design has a number of advantages over a piston pump. The most valuable to you is that there is less wear on moving parts. The abrasive nature of concrete is a real killer for the steel mechanisms of piston pumps. With a peristaltic pump, the rubber squeeze-hose keeps the material confined and prevents any metal parts from coming in contact with the abrasive concrete. Because the concrete only touches rubber hose, you get the equivalent of a brand new pump every time you replace your hose! This saves you a bunch of money in machining, replacement parts and downtime when compared to a piston pump rebuild. It really boils down to what it cost to replace worn parts. Piston pumps rely on metal parts to force the concrete out the end of the hose. From the first day of operation, concrete rubs against the metal and begins to wear the piston pump. As the abrasion continues, the pump degrades, and it takes serious money to replace the worn out machined parts. Peristaltic concrete pumps experience wear as well, but a hose can be replace by people on the job-site for a relatively low cost. Operators of a peristaltic pump will typically stock spare hoses and be prepared to change them when pumping efficiency drops. Peristaltic pumps do not push at the same high pressure as a piston pump. Consequently, a worker is far less likely to get hurt from a squeeze pump. There are real dangers from a hose rupturing or a clamp letting go when working with the high pressures created by a piston pump. On the other hand squeeze pump operators really need to know what they are doing, and they need to make sure their concrete mix good for pumping – one that properly moves through the system. Remember: the better the concrete mix, the better it pumps. Harsh, low cement-ratio mixes will not give you a superior end-result concrete, nor will they pump well. Such mixes need higher pressure pumps. Here’s another fantastic advantage of the peristaltic pump: its delivery of the shotcrete is much more even. 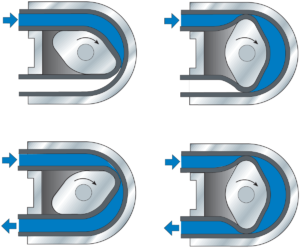 Unlike the piston pump, the peristaltic pump does not bounce the nozzle operator all over the place. Consequently, material goes onto a surface with a smoother, steadier action, producing a much nicer outcome. We would love to get your input on the Cart-Away Skweez Pump idea. If you have some experience with concrete pumping or shotcrete, we would love to have you reach out to us and share your expertise. Cart-Away wants to do this right and we welcome your thoughts.